One of my missions is to try as many sealants, topcoats, glazes, etc. 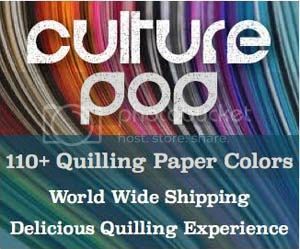 for paper quilling as possible and to give reviews on them. I know it is information that was missing when I was first starting to make quilled jewelry, so I’d like to be helpful for others out there. When I make quilled jewelry I like to use two products. The first product I use is a liquid sealant. It seeps into the paper and when it dries it leaves it stiff and fairly water resistant. Then I use a topcoat to make it very water resistant and sometimes to give it a nice glossy look. You don’t have to use a base liquid sealant. I have tried without and it is fine. But I do prefer it with, as I like a piece that is more stiff. However, the liquid sealant that I use can only be found in Malaysia as far as I know. So when I was in the US a couple months ago I stocked up on some to try. One well known brand of craft products is Aleene’s. I bought several to try out. One was this Aleene’s Stiffen-Quik Fabric Stiffening Spray . The bottle does NOT say that this is to be used on paper. But it was a liquid and I thought it was worth a try! I poured a little bit of the liquid into a small bottle cap and used a paintbrush to paint it onto three different quilling pieces. One was a rose bead and the second was the umbrella part of a jhumka earring. The third was a disc for circle earrings like these. The first thing I noticed was that the liquid is perfectly clear. That can be a plus – you don’t need to worry about it drying whitish (though I use other sealants and topcoats that are white and they dry perfectly clear). I painted it onto a yellow rose bead and it soaked in well. I set it out to dry. I painted it onto the jhumka earring and noticed that it darkened the color of the paper considerably. But as it dried it went back to its original color. I soaked the disc on both sides in the sealant, dabbed it on a tissue, and laid it to dry. It also turned a little darker, but went back to the original color after drying. I noticed that there was no bleeding of colors with this sealant. But the most important, and in the end, the ONLY important information is whether this stuff worked after drying! I am SO sad to say that it didn’t do anything to the pieces. I couldn’t really tell with the rose or the jhumka earring whether it had any effect, since the rose is compact and the jhumka had PPA on the inside of it, so it was already in a stiff shape. But I could tell with the disc. Once the Stiffen Quik had dried, I could still push and shape the disc into a 3D shape and flatten it back again, just as if there was nothing on it. I soaked it in a second coat and let it dry, still no effect. I did notice on the Amazon reviews that even for cloth you sometimes have to put several layers. But when I’m making my jewelry I don’t want to have to put on several layers to have such a slight effect. It’s not worth it. The funny thing is, I left the leftover Stiffen Quik in the bottlecap overnight. In the morning it had dried into a plasticky layer that I peeled out, just like most of the other sealants and topcoats that I use. Maybe it is just a lot thinner and that’s why it takes so many coats to work. Or maybe it’s just not formulated to be able to work well with paper. 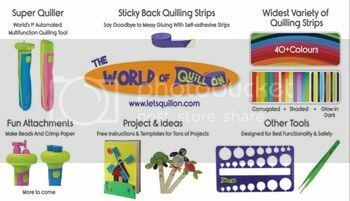 I’ll keep the Stiffen Quik and try it on some crafts that it was meant for just for fun, but I won’t be bothering to use it for paper quilling! I’ll be reviewing more products that I purchased over the next few months, so stay tuned! In the meantime, browse here for some previous posts I have written about sealants for paper quilling. Stick around, there is a lot of great stuff on the blog! *This post contains some affiliate links. If you purchase products through the affiliate links I get a small percentage (at no extra cost to you!). Thank you for supporting my blog! Can You Use Clear Nail Polish to Waterproof Paper Quilled Jewelry? Finding a good sealant that doesn’t alter my work has been my biggest frustration and mission. Thank you for this article and reviews. You’re welcome 🙂 More reviews coming!